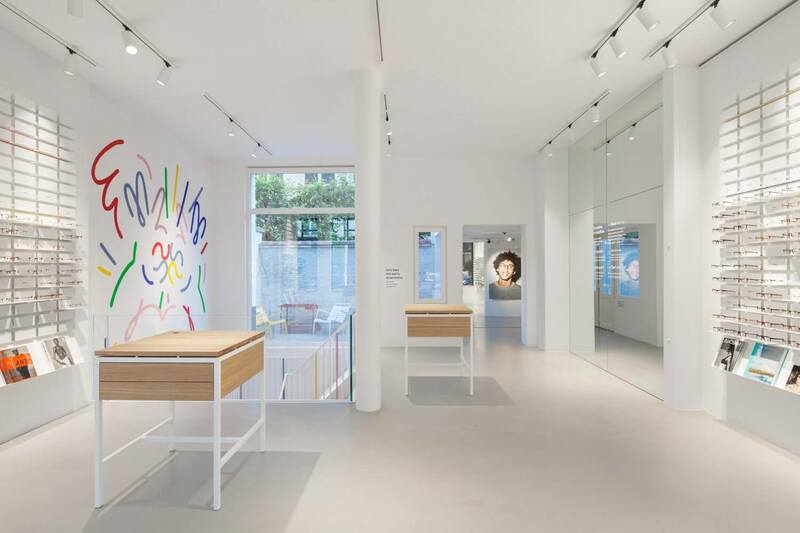 Standard Studio was asked to design the new shop for Ace & Tate in Antwerp. 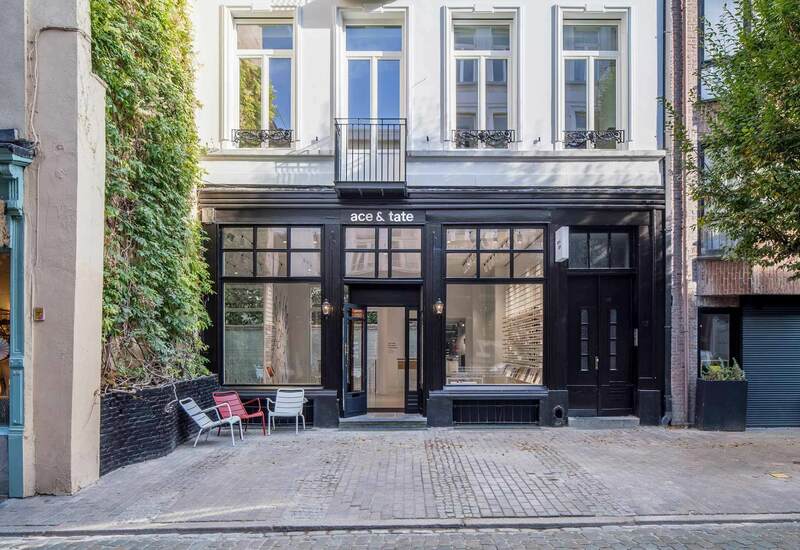 Located at the Steenhouwersvest, adjacent to the Kloosterstraat it’s part of the vibrant area in the city centre. At the facade of the building vibrant green ivy instantly attracts the eye of passers-by. Standard Studio has made the most of this alluring outdoor space by adding a small terrace directly outside the shopfront. As people stop here to rest and enjoy the surroundings their attention is instantly drawn inwards to the shop’s fresh, bright interior. 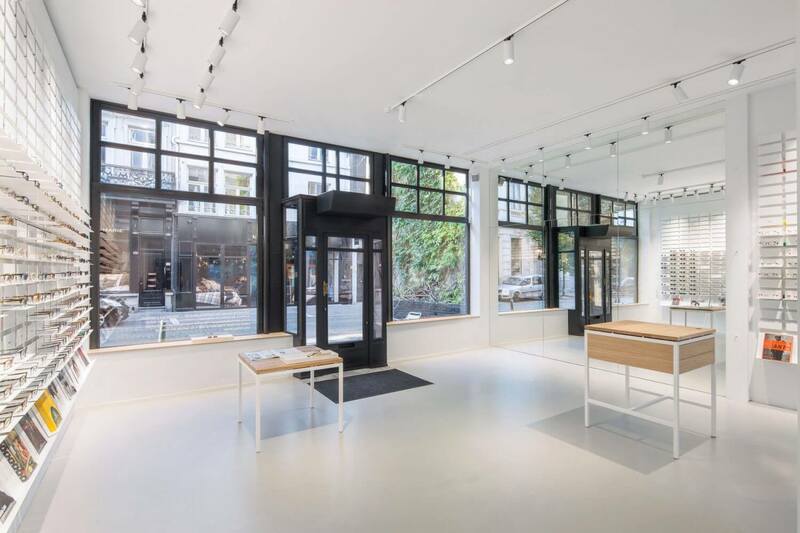 On the main shop floor a plethora of natural light from the building’s large windows is enhanced by a playful use of mirrors. This provides the interior of the shop with a feeling of spaciousness that flows seamlessly from one room to the next. At the rear of the shop floor is the hangout: a space that invites the customer to sit back on the comfortable sofa and soak in the atmosphere. The lush adjoining courtyard complements the hangout. On sunny days the doors between the two can be pulled back, maximising the design’s feeling of free movement. A wide floor-to-ceiling window frames the bright outdoor space of the courtyard, spilling light down the open mezzanine-style staircase to the basement level below. 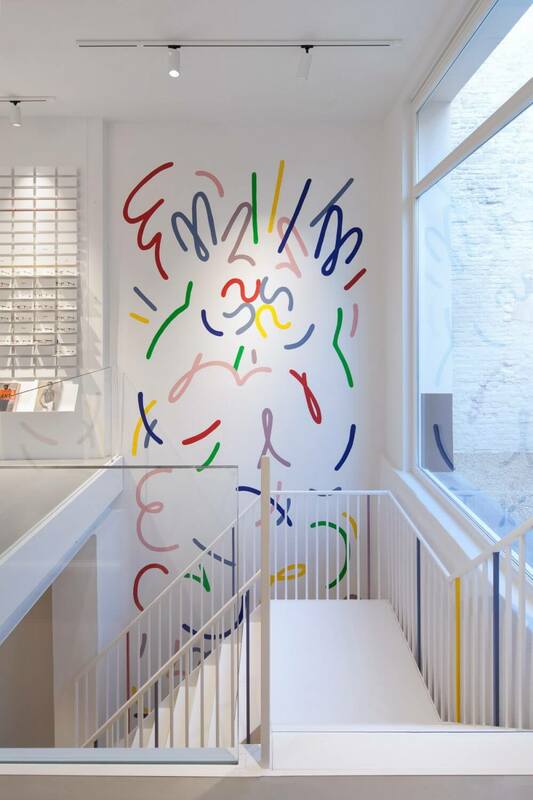 This is further enhanced by the double-height wall displaying the vibrantly coloured artwork of well-known artist Jordy van den Nieuwendijk. The white staircase borrows hints of colour complementing the artist’s choice of tones. 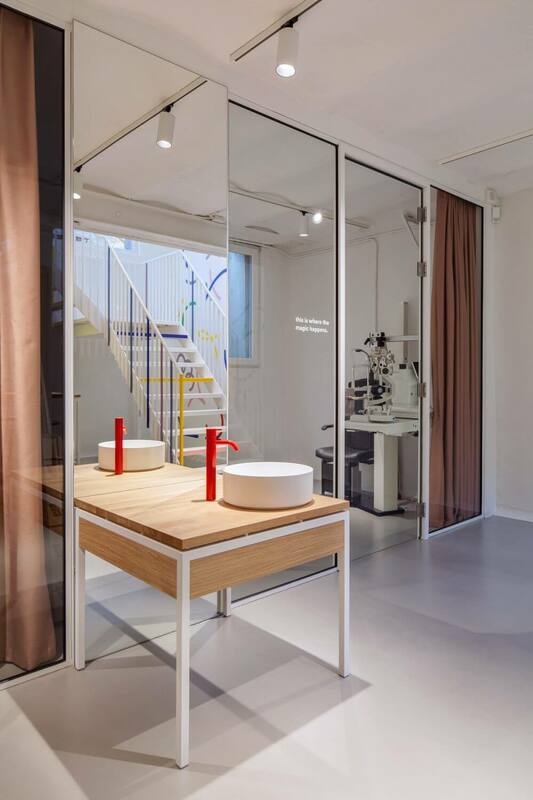 With awareness that basements tend to be less-visited retail spaces, Standard Studio’s design has dedicated the entire basement level to practical services, including the opticians’ rooms and measuring devices. Here a slim, stylish custom-made cabinet keeps appliances out of sight. 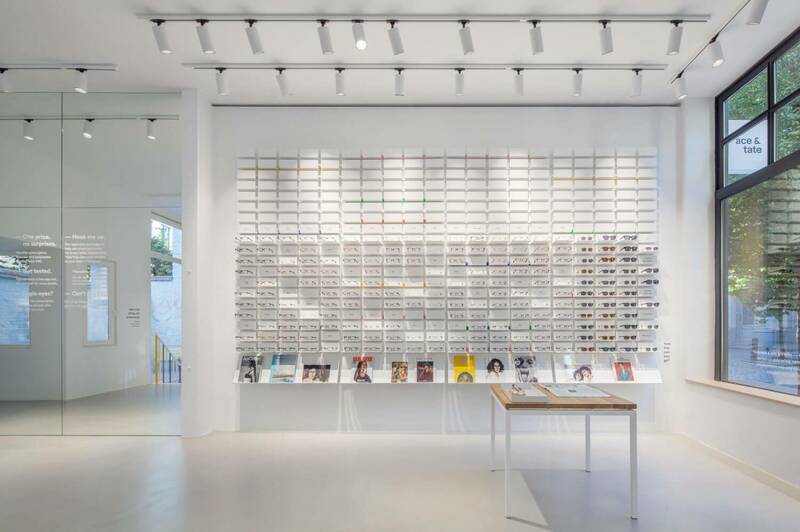 The vast floorspace saved in the absence of a retail counter provides a trendy customer waiting area. 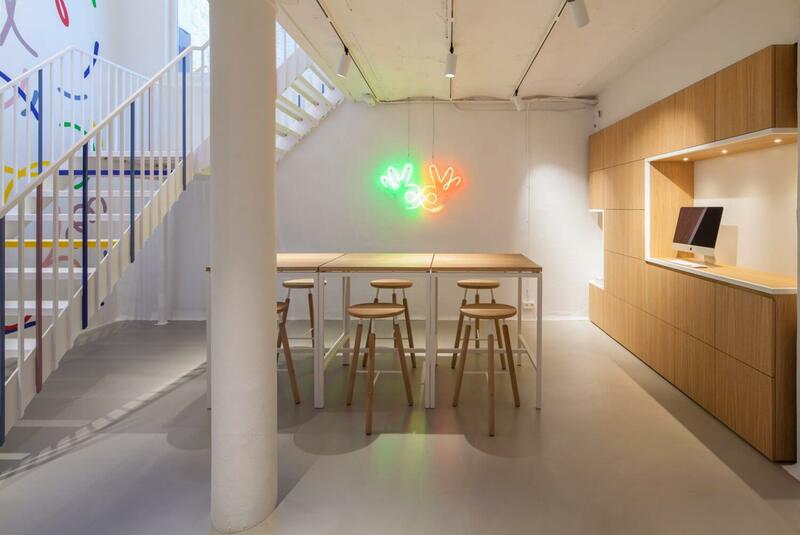 This lively space is characterised by colour from Jordy van Nieuwendijk’s wall artwork and the correlating neon sign; that latter of which adds an exclusive twist to this unique design.